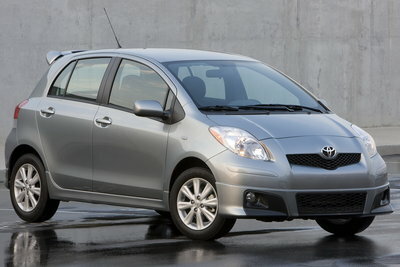 The Toyota Yaris serves as the entry-level model for the brand. The Yaris has been sold in other markets; however, this is the first model that will also be sold in the US market as well. Offered in 3-door hatchback, 5-door hatchback and 4-door sedan forms, all Yaris models are powered by a 106hp, 1.5L 4-cylinder engine. The FWD subcompact is available with either a 5-speed manual and 4-speed automatic transmission. While offering relatively attractive styling and roominess, the main selling point for the Yaris is fuel economy. Features are relatively sparse on the base model, but most common features can be added with optional convenience, power and appearance packages. A 5-door hatchback version of the Yaris joins the sedan and 3-door hatchback.